Penn State vs. Maryland on Saturday, Nov. 25, 2017. Concussions are an all-too-common occurrence among football athletes, with the NFL reporting 281 concussions during the 2017 preseason and regular season. Though more accurate reporting of the concussions has improved in recent years, it hasn’t done much to actually prevent the injuries -- 2017's rates were actually the highest among data from the last five years. There could be hope, however. Researchers at Penn State University recently completed a study observing how effective soft shell helmet technology can be in preventing football head injuries. Use of a product called ProTech, created by Chester County-based company Protect Your Head (PYH), was observed over three years in Penn State Nittany Lions players. The results were extremely hopeful: The research team found the weekly reduction of concussions per player to reach 72-79 percent. Check out a brief overview of the study in the clip below. 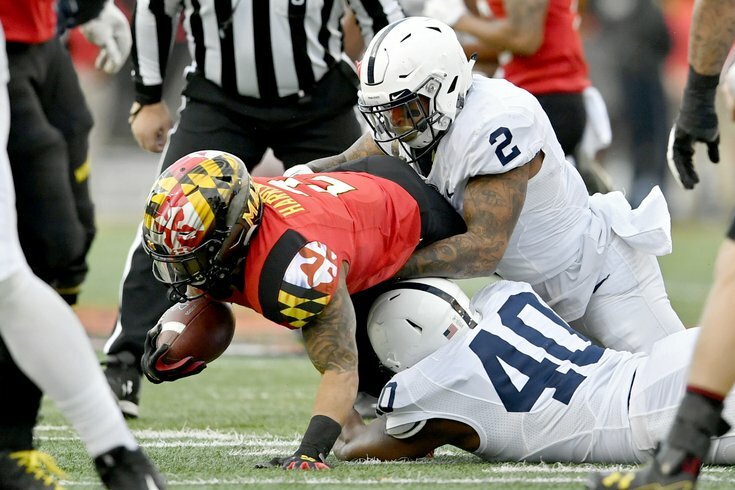 Using helmet sensors to measure impact, Penn State found a dramatic reduction of high-intensity head collisions. Further details of the study are outlined here. “ProTech is changing the conversation around football and safety,” said John Roman, Defend Your Head founder and president, in a statement. Roman is also known for playing seven seasons on the New York Jets. “No other add-on safety technology company has subjected itself to this level of independent testing rigor,” said Glenn Tilley, DYH’s executive chairman and CEO, in a statement. The helmets tested use a patented helmet cover using a material designed to absorb and dissipate energy. DYH currently works with 80 teams from youth level to major Division I programs.